Free Delivery to all Melbourne's Inner Suburbs 7 Days a week. Celebrate the best of times with this glorious bouquet of colourful blossoms. Someone will remember you always. This fine flower bouquet is an excellent choice for a woman and can also be sent to a man. 101 Collins Street is a 260-metre (853 ft) skyscraper located in Melbourne, Australia. The 57 storey building was completed in 1991. The tower is currently the 4th tallest building in Australia when measured up to the tallest architectural point which is the 60 metre tall spire. The tower contains 83,000m² of rentable space which are rented by large companies. The floor to ceiling height is unusually large for a skyscraper at 2.77 metres. The building contains double glazed windows with surface coated tempered glass which will increase thermal efficiency. , as a premium florist in 101Collins Street, provide weekly flowers and events flowers to many companies and shops on 101Collins Street. We also supply free flowers delivery to 101Collins Street for all occasions. as the most reliable florist have kept sending flowers to 101Collins Street for many years. Our nicely staff work with heart on each order, therefore we have got more and more satisfied and regular customers continuing purchase with us. can guarantee to send the freshest flowers the same day to 101Collins Street and near by Epworth Hospitals, and Frances Perry House. 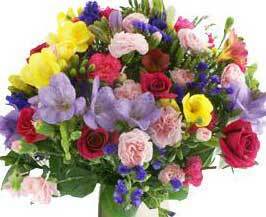 ABC Flowers Fitzroy is the leading Melbourne florist offering flower delivery Melbourne Wide. We send flowers Melbourne wide including hospitals, hotels, business, home, and funeral service for all occasions such as get well, new born baby celebration, anniversary, birthdays, thank you and more. We are located in St. Vincent's Hospital Melbourne CBD. We have been serving local communities, and hospitals for many years. We are renowned as one of the most reliable florist in Melbourne. We open 7 Days a week, and we deliver flowers Melbourne wide 7 days a week. We offer free Melbourne Inner Suburbs 7 days a well.